Title IX of the Educational Amendments Act of 1972 transformed women’s sports in America and is now a familiar historical marker. Women’s basketball has grown at all levels from secondary education up through the WNBA. For many, women’s basketball is seen as a new phenomenon on the national sports scene. In point of fact, its existence stretches back to the origins of the game in the 1890s. In this fascinating history, Lydia Reeder’s focus is on one season of women’s basketball in the early 1930s at the Oklahoma Presbyterian College (OPC) in Durant, Oklahoma. Reeder reveals the significance of the women’s game in the development of the sport and in the lives of young women well before Title IX. Lydia Reeder, a former magazine editor, is the grand-niece of Sam Babb, the highly successful coach of the Oklahoma Presbyterian College Cardinals. Babb was dedicated to the game of basketball and to the women who played it. Reeder had access to family stories, diaries, scrapbooks, and was able to interview the surviving players. She conducted extensive research in newspapers and local records and is well versed in women’s history, sports history, and the social history of the southwest. 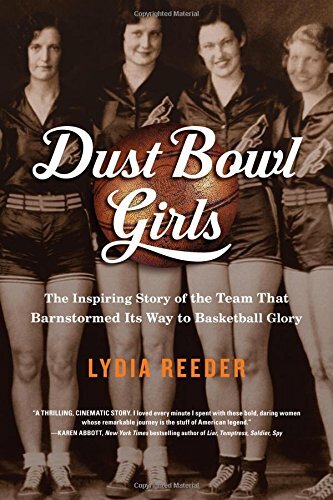 Dust Bowl Girls is not simply a history of a highly successful basketball team, but also a history of women’s basketball in the southwest in a time of economic crisis. It is the story of the leadership of a woman’s religious college dedicated to enhancing the lives of its students. A number of the players are central characters in this history, including the captain of the Cardinals, Doll Harris, the daughter of sharecroppers, who starred as a high school player for the Cement Lady Bulldogs. In the midst of drought and the Great Depression, Doll dreamed of playing basketball for a women’s industrial league team. She had not thought about college and seemed to be unaware that basketball could open that door. Sam Babb changed that for Doll Harris and many other young women in Oklahoma that he recruited to come to OPC on a basketball scholarship. Oklahoma Presbyterian College was a member of the American Athletic Union (AAU) and participated in the AAU basketball circuit in the Southwest. One of the nationally known players in the region was Babe Didrikson of the Dallas Golden Cyclones, a team that ultimately became an archrival of the OPC Cardinals. AAU basketball teams played a more competitive and aggressive game than the style favored by many physical educators in the Athletic Conference of American College Women. These college leaders and physical educators deplored intense competition for women and decried national or even state and regional championships for women. Doll Harris and her teammates knew the strength of women who came out of struggles for survival in rural America, and they were amazed that anyone would think that basketball was too strenuous for women. One of the strong themes of Dust Bowl Girls is the struggle of ordinary people for survival in the Depression and the realities of the drought that was beginning to engulf the region. Among other struggles for Coach Babb was maintaining the finances of the college, finding expense money for the team to travel, and keeping the team bus operational throughout the season. Perhaps the most important story told by Lydia Reeder is that of the significant role of sport in the lives of these young women. Basketball offered the opportunity for a college education, for travel, and for the pure joy of sporting competition. Those who play at whatever level understand that playing a sport is as much about the process as it is about the outcome, and Reeder conveys this very well through the experiences of these young women. Each of the members of the OPC Cardinals seemed to take something personally important from the game as well as from the total experience of college life and the rigors of high-level competition. Team dynamics and personal interrelationships are a central part of this story, as is a search for identity and meaning in life. Reeder’s story of basketball at OPC clearly reveals these varied elements for each of these women. Sam Babb, coach of the OPC Cardinals, emerges here as a complex character with a fascinating backstory of his own. His belief in basketball and his belief in his players is a story well worth telling. If Dust Bowl Girls has any weakness it would be a tendency to over-dramatization and overuse of sports clichés, not simply in language but also in narrative structure. It is, of course, difficult to avoid this linguistic trap when dealing with winning streaks, close games, and championship competition. This is a multilayered history and a compelling story as the women who played basketball for OPC reveal much about their time and place. This one seemingly minor aspect of women’s sport in rural Oklahoma is one worth knowing and worth reading.